Happy New Year! With the new year typically comes loads of resolutions and the optimism to keep them for the entire year. Since resolution has slowly taken on a negative connotation I am instead going to make some goals for the upcoming year. Resolutions don't exactly turn into commitments is more than likely due to not having a plan to accomplish them which is one of the reasons I decided to make goals instead. It's great to set goals but without thinking of ways you can accomplish them then they are going to remain goals instead of accomplishments. 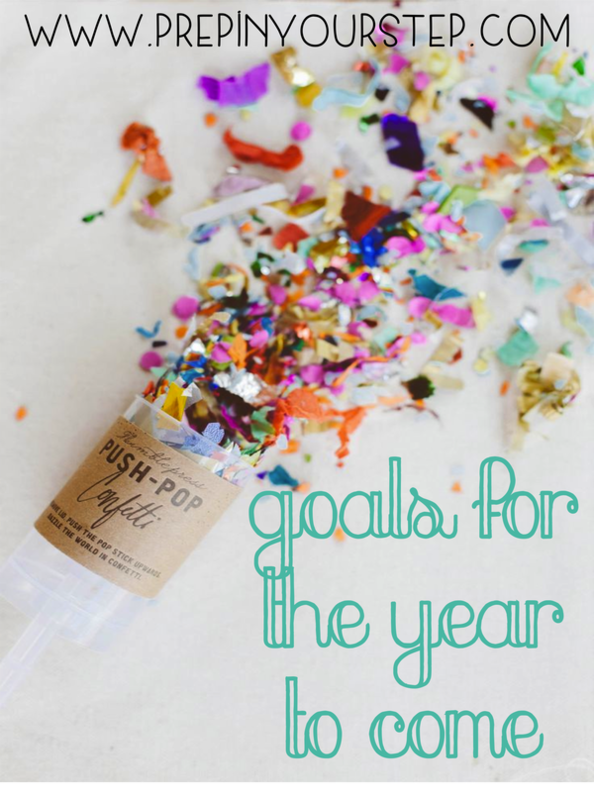 Here are some of my goals for the coming year separated into different categories! continue to raise my gpa… This past semester was an awesome one for my GPA which is shocking since it was also my most academically rigorous. Funny how those things happen but I ended the semester with all As which definitely made my GPA do a bit of a happy dance. While I know that this semester will also be challenging I hope to have the same motivation and drive that will hopefully help this goal continue to be a reality. take advantage of my campus and the surrounding community…If you've never seen Furman you need to google it. You back yet? My campus is absolutely beautiful (my parents joke that I go to resort school) and I definitely want to appreciate that more. I love runs around the lake and walking to class but as my time here begins to dwindle I know that an appreciation now will hopefully make eventually saying goodbye easier. As for the surrounding community, Furman is in Greenville, SC and has so many neat areas surrounding it. Whether this means getting downtown more frequently, hiking new trails, running more of the Swamp Rabbit trail, trying all the ice cream shops around, or driving a different way to get somewhere exploring this area is well worth my time. Also, since I'll more than likely be in Greenville for a few years after graduation I may as well get to know my surroundings so it will eventually start to feel more like home. sleep more… Hear me out on this one. I debated putting this in my mental and personal health category but in reality my lack of sleep is due to school so I decided that it is going to be in this category and since these are my goal hopefully you'll agree that I have the liberty of doing that. Last semester my sleep was often sacrificed in order to get other things accomplished but this year sleep and knowing when to go to sleep needs to become more of a priority. take a class just because… This semester I am doing this for the first time. I am hoping that next semester I can take a ceramics class that I am interested in as an elective just because. This is one of the benefits of going to a liberal arts school and having so many classes offered in a variety of topics so hopefully I'll be able to better take advantage of this. read more (and not just for class)… Reading for class is obviously important but reading for pleasure is important too. This past year I wasn't able to read through as many of the blogs I enjoy reading let alone read books for fun. This year I am hoping to spend a little bit of time most days catching up on the Skimm, reading blogs, and even maybe reading a chapter or two of a book. be the best KD president that I can be… The most important part of this phrase is the "that I can be." I need to remember that I was voted into this position and that my chapter has confidence that I'll do a good job. By fulfilling my duties to the best of my ability then I am working towards being the best president that I can be and that is all that is being asked of me. help our chapter to gain recognition for our endeavors… I couldn't be more proud of my KD chapter as a whole and the many different things we do. Both Furman and our national organization have so many awards that I feel like our chapter and chapter members are deserving of and I would love to work towards this recognition for our organization. be intentional… I know that there are times in this upcoming year that will be hard. I'l likely be pulled in different directions with decisions and I want to make sure that I am intentional with both my relationships and the decisions that I make. I'll have the opportunity to meet lots of people that I may not have gotten to know otherwise and I really want to take advantage of this as well. be better about responding to emails… Y'all… I've been AWFUL when it comes to responding to emails which is terrible since emails from y'all make my day. It is so cool to form these connections but sometimes with school and other commitments it can be so overwhelming and take the back burner. This year I am going to try to become better with managing these in order to make sure that it seems to be more of something fun than a chore. I have so many that need to be responded to currently and as I slowly work through those hopefully I'll gain momentum and respond in a much more timely fashion. continue to grow… I am always so amazed when new people find my site and begin to follow along with my little corner of the internet. Something that started as a way for me to do something for myself four years ago has grown so much and provided me with so much fun and many neat opportunities along the way. I hope to continue to provide unique content and a fun perspective and hopefully will grow some in the year to come by doing that. redesign… This is something that has been on my mind since summer and since I'm a perfectionist will probably stay in the brainstorming stage a little bit longer. Hopefully sometime in the next year Prep In Your Step will get a fun refresh that makes navigation easier and provides a bit of fresh perspective. I don't want to say I'm necessarily *focusing* on one area more than others but if I were I think this is the one that I would have to choose. Probably because it is the one that is going to take there most conscious effort in order to achieve these goals and also because I included more subgoals in this category. I included more because these are all smaller things that can make a big difference in my attitude and overall mental health which I've heard is pretty important! stress less & find balance… This year I need to balance out responsibility and fun a whole lot better. I can find myself getting wrapped up in the details and the idea that I should be doing more but in reality I need to work on dividing up my time better between school, obligations, and fun. I'll let you know if I ever figure out some sort of formula for that but my Step Into My Week posts are a good way to track that progress. take me time… This kind of goes along with my last goal. Taking time to relax in my pajamas, catch up with a friend, or watch an episode of mindless TV is necessary and I need to remember that time alone and time for myself is important. moisturize… My skin is weird. When I am stressed out I get a weird stress rash and my face is dry and my lips are chapped. Maybe that is because it's January but I think moisturizing is a nice and easy achievable goal that will help me to feel more refreshed. choose the positive… Whether this be relationships or an attitude I could always work on my own positivity and surrounding myself with people who help to bring that out. In a stressful school environment sometimes this can be hard but the more I practice it the more positive things will seem, right? don't always worry about pleasing others… I've always been a people pleaser. Because of that I spend a lot of time focused on what other people may want and need to be better at focusing on what I want. It may sound selfish but it's definitely a necessary part of mental health. run farther… I really do like running however this past year I found myself running for the same amount of time and distance for the most part. I would love to up my mileage some so that I can venture on new trails and de-stress a bit longer. have lots of fun… Be spontaneous, go out more, forget the books for a while, whatever it takes hopefully more fun is in my future. I hope that this year I can take advantage of different opportunities to do this! drink more water… Another health related one thrown in. I'm going to attempt to do this by drinking a few sips or a glass before bed and right when I wake up! So there you have it a long list of what I want to do and why in the coming year! I'd love for y'all to share any goals you may have with me! When I was in college, I never had time for leisure reading - everything I read was strictly for class. I hope you'll be able to find more time to relax and enjoy a good book :) (and obviously achieve your other goals). Love these goals. I am taking a drawing class just for fun this semester which I have never done in college! Love these goals! Mental and personal health are so important but can also be the easiest to put on the back burner- I love all the goals you came up with and i'm going to add a few to my list! Good luck! Love reading your goals for 2016! I definitely want to read more and workout more often this upcoming year! Good luck Dorothy with your goals! Your goals are so inspiring! I also have a goal of getting more sleep this semester. College can really hurt your health by encouraging you to sleep less! Good luck!! Hey I'm Katie! I just started my new blog yesterday! I would really appreciate it if you would take a look, and possibly give me a few tips or advice! Thanks so much!!! Love these goals! My campus is also really beautiful and I hope to take in more of it and experience it more before I graduate. Indeed a very good thing to consider with some values for future success, also there might be good combination between other prospective authorities as well. Really wishing for a new blog post! Hope to see one soon!